The Banks of Chicago may with propriety be numbered among the public buildings, and, taken as a whole, are certainly very beautiful as specimens of architecture. FIRST NATIONAL, S. W. corner Lake and Clark Sts. SECOND NATIONAL, N. W. corner Lake and Clark Sts. THIRD NATIONAL, corner Dearborn and Randolph. FIFTH NATIONAL. 50 La Salle Street. NORTH WESTERN, Chamber Commerce Building. TRADERS’, 40 South Clark Street. 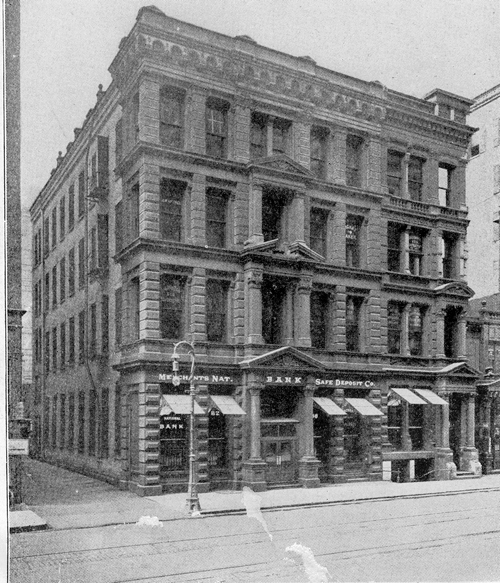 UNION,, SW corner of Washington and LaSalle Streets. MARINE, Lake and La Salle Streets. BANK OF MONTREAL, 48 La Salle Street. MERCHANTS’, FARMERS’, AND MECHANICS’, 13 Clark Street. STATE SAVINGS INSTITUTION, 82 La Salle Street. I am trying to find the Western Trust and Savings Bank and who bought it out.